If you want to open a blog you can be up and running in about 15 minutes with this step by step tutorial on how to start a blog using BlueHost and WordPress. I’ve been blogging for over three years now, mostly as a passion and I have only became more professional in the recent months but never thought I’d end up making up a start a blog tutorial. I don’t pretend to be an expert but I often times find myself giving blogging advice to both bloggy and non bloggy friends that turn to be just the answers they’ve been looking for. That makes me really happy, I know I had a hard time getting a blog up! So if you’ve been following blogs like this one for a while and flirted with the idea of expressing your thoughts, feelings and life experience, then you are ready to open a blog. And you’ve come to the right place. You absolutely need a blog whether you want to work from home, author a book, get more exposure for your existing business or just write your thoughts. 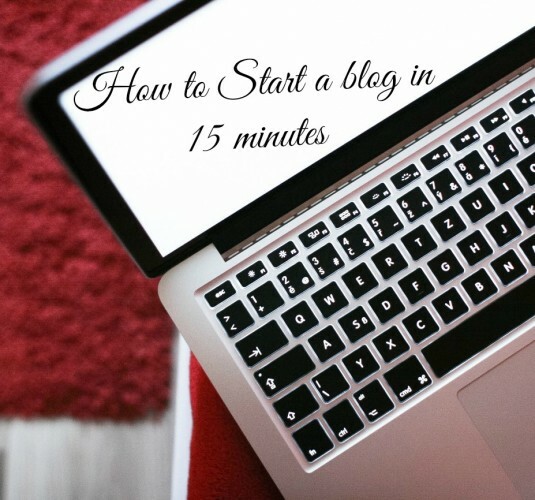 Fortunately you can be up and running in about 15 minutes with this start a blog, step by step tutorial I’m going to introduce to you. It took me 10 minutes when I had my other WordPress blog up and running and this tutorial is based on that experience. Why would I write about a WP blog instead of any other platform? Simply because it’s way more awesome than any blogging platform and if I had known that 2 years ago, this blog wouldn’t have had its start on Blogger but on the WP platform. Problem solved now as we fully transferred here to the beautiful WordPress. 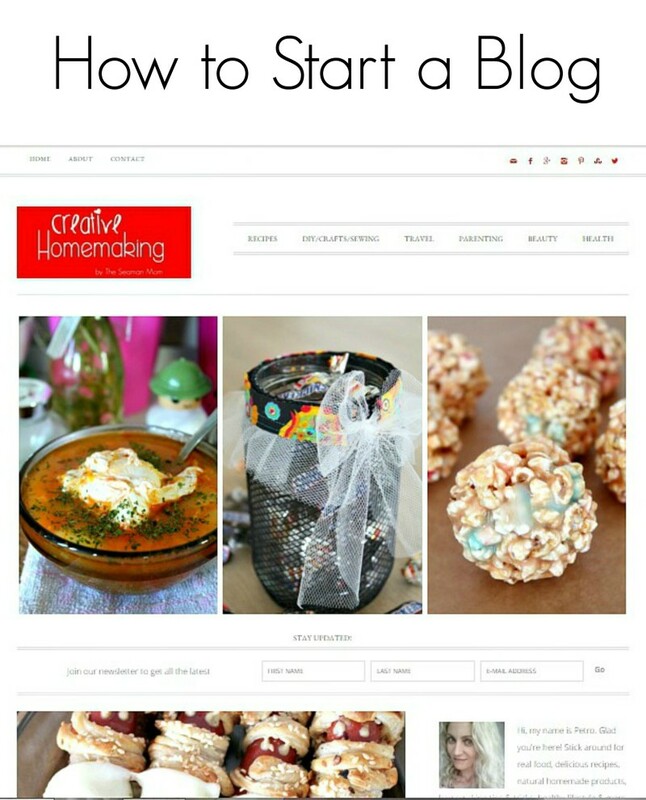 Let’s get started with the basics on what’s needed to start a blog. If you are brand new to blogging and wouldn’t want to invest a little money in your blog then Blogger is the right place for you. But I would strongly recommend you think twice before taking that decision as if you are like me, you’ll find you are in fact way too passionate about blogging to keep yourself and your blog at a non professional level. The option I’d recommend is right below. 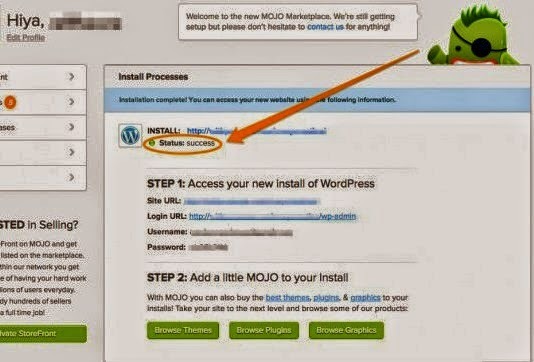 If you follow my start a blog tutorial do yourself a favor and open your blog on a WP platform. Get it to a professional level right from the beginning, you won’t regret your decision a bit. You totally get what you pay for and then some more. The following steps are exactly how I’ve built my other site Little Miss Fashion and I’m completely smitten with that place (and now with this place too) and the features I’m provided with. This start a blog tutorial is not short but trust me, it’s really, really simple. To sum up what this tutorial is all about, by the end of this post, you’ll have a self-hosted WordPress site, the most popular type of site around. Note: All links will be opening in a different window for ease of reference to these instructions as you work. A host provides server space for your site so others can find you on the internet. As I’ve mentioned, you could start a blog using a free service like Blogger, but if you can spare a little cash, I highly, highly recommend you opt for self-hosting. Trust me, you’ll be so glad you started out on the right foot. I am the living proof of that. I was lucky enough to get to experience both platforms and the self hosted is by far the best option. I am using Blue Host on both my sites as I’ve heard great reviews about them and yes, they are all true! For starters, they make signing up and setting a WP blog with them a breeze, all you need to do is follow instructions on both their site and the e-mails they keep you updated with on each step completed. Start by clicking here to go to Bluehost. Click the green Get Started Now button. Enter a domain name (your desired web address, like thelittlemissfashion.com as I did when setting up my other blog) on the left side under New Domain (see tips for choosing a domain below). Make sure .com, or the extension of your choice, is selected from the drop down menu beside it. If you’ve already registered a domain name somewhere else, enter it on the right hand side. Then click the blue Next button. Choose a .com if possible, it’s easier for readers to look for your site as everyone has a .com in mind when they’re searching for websites. Make it easy to say and spell. I got mine thelittlemissfashion.com to perfectly match my blog’s title: Little Miss Fashion. Don’t include hyphens, numbers, initials, obscure terms or confusing strings of words, that’ll only make it hard for people to find your website. If you’re not sure what to use, your name is ok to use as a last resort. On the next page, enter your account info. Make sure you use an email address you use the most because this is where your login information will be sent. Under Package Information choose your Account Plan from the drop down menu based on how far in advance you want to pay. Please note you will be billed a year a time, but as you can see, it works out to a very reasonable monthly amount. I think that’s basically nothing, you get so much for your self hosted blog for that little amount of money. Fill in your billing information, confirm that you’ve read the fine print and then click Next. On the next page you’re asked if you want to add any upgrades. I just skipped them all. Continue on to complete your purchase then check your email. 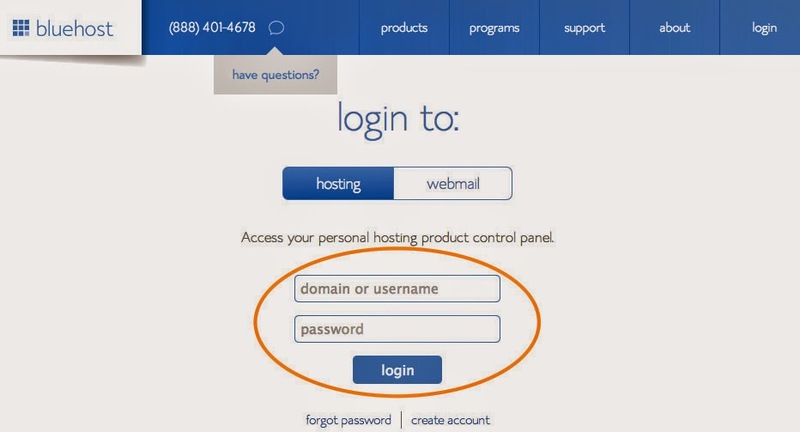 You’ll find a welcome email from BlueHost with your control panel (named cpanel) login info. Keep this information for future reference. 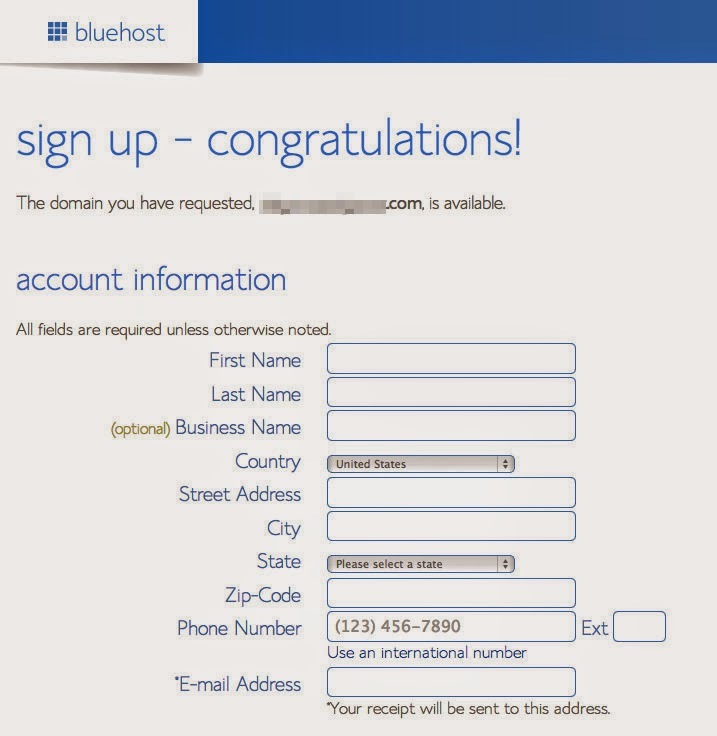 Go back to Bluehost and click the Login button in the top right corner of your screen. Alternatively, you can use the link to your cpanel received through the welcome email. Enter your cpanel login info. 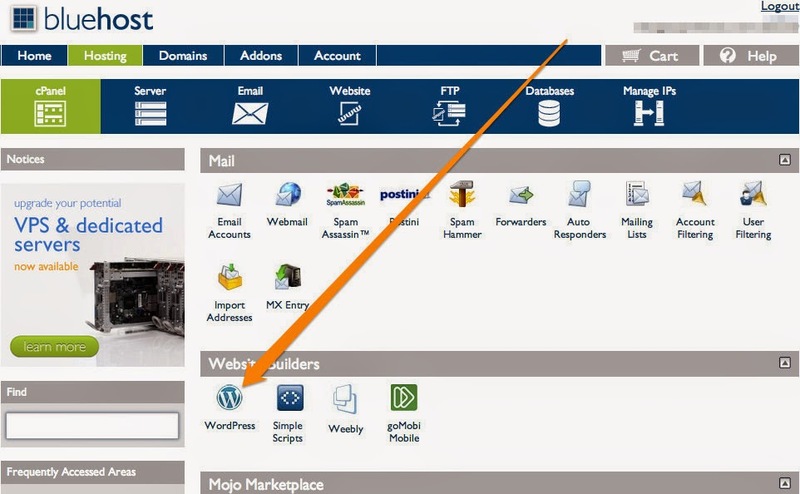 Once logged in, click the WordPress icon under Website Builders. Next you’ll get to a window that looks like this. 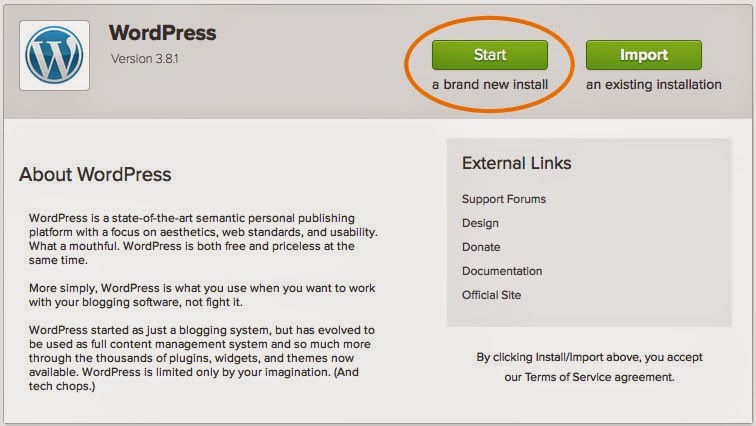 Click the Start button to begin the WordPress installation process. Leave this section as is with your domain showing in the drop down menu. Simply click Check Domain. Check the box next to Show advanced options. Enter your Site Name or Title (ex. Little Miss Fashion). Choose an Admin Username (do not use “admin” as your username) and password. These will be what you use to login to WordPress once it’s installed. Enter your email address (again, all site information will be sent here). Read and agree to the terms. Click the Install Now button. This is where you will pick a theme with the desired design. There’s a variety of free WordPress themes that you can choose from. If you are trying to save money then I suggest just choosing a free theme but if you’re willing to take your blog to a more professional look and feel, I’d recommend you opt for a paid theme. I chose a free theme not for the financial reason but for the lack of time. I just couldn’t decide which theme I like more and opted to postpone this for later. But if you’re not short on time I would strongly recommend go browsing through those amazing Mojo paid themes. There are so many gorgeous options starting at only $49. Take your time, your blog theme will say a lot about yourself and the message you’re trying to convey through your writing. Step 13 – Start a blog: You’ve Made it! Done! Take note of the information to access your new WordPress site. This information will also be sent to you via email. Clicking on the Site URL link will take you to your brand new, live website. Clicking on the Login URL link will take you to the WordPress login page where you can enter your username and password and get into the admin panel of your WordPress site. Congratulations! You’ve just managed to start your blog. Type your domain into a browser and your WordPress site will appear. (If you registered a new domain in Step 2, skip this step.) Your existing domain will not display your new site until you change your nameservers wherever your domain is currently registered. The change will be pointing your domain to this new site. IMPORTANT! As soon as you change your nameservers, your domain will bring visitors to this new site. Therefore, if you are currently using your domain on another site, do not change your nameservers until your new site is up and running. 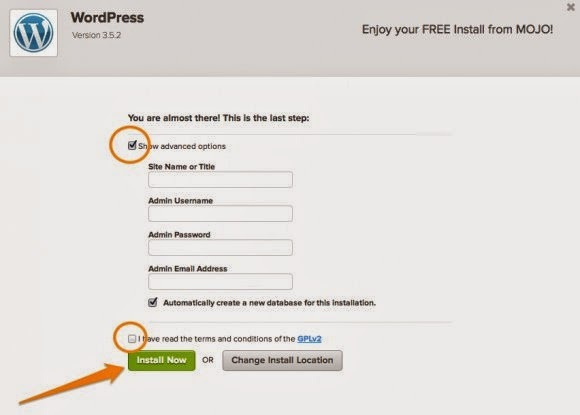 You can still access your new WordPress blog via a temporary URL. 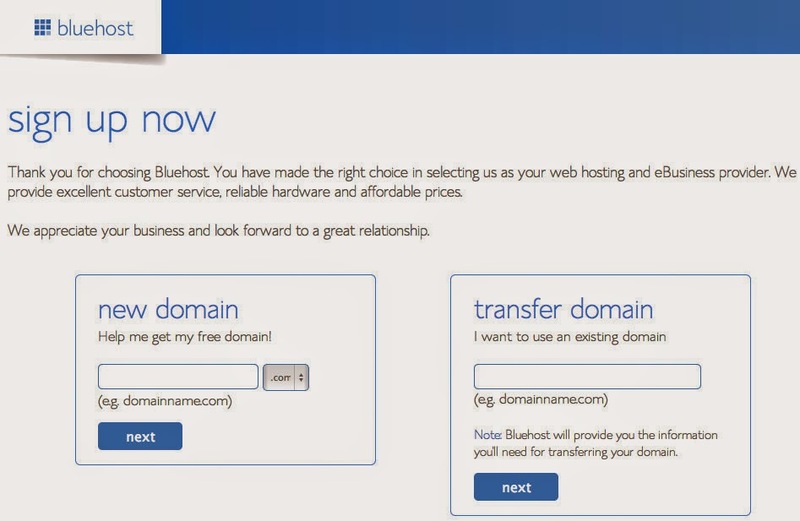 You may have received one in your welcome email from Bluehost. If you didn’t, simply call them and let them know you need a temporary URL for your new site. BlueHost has a 24/7 call service (help desk) you could use and a live chat service. To change the name servers where your domain is currently registered, first note your new Blue Host name server information which can be ns1.BlueHost.com or ns2.BlueHost.com Next, go to the registrar where your existing domain is currently registered (Namecheap, GoDaddy etc.). You will need to enter the above information in the appropriate place. This varies among registrars so I recommend you call them if it’s not clear. This is what I did with this blog when transferring from Blogger to WordPress. I hope my start a blog tutorial has been of help and I look forward to hear your input and also read your new, beautiful blogs. If the information above doesn’t fulfill your needs, you can always learn more about BlueHost here. 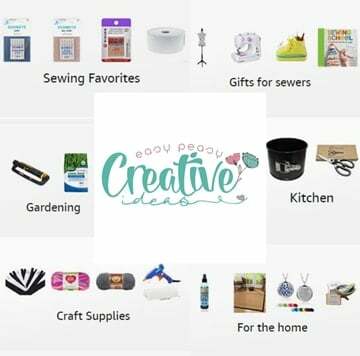 This post contains affiliate links which means I will get commission if you click on them and make a purchase. This is excellent information, thanks for sharing. I’ll be saving this as a resource for myself and others. 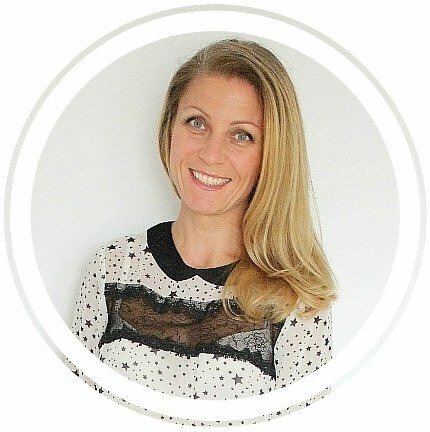 Great work Petro – there’s no reason for anyone to feel intimidated about blogging – its so much fun. Great post, I teach this via a Blogging 101 class for the Money School of Delaware.